If you are wondering whether WhatsApp is down or you are facing connectivity issues to your favourite messaging service, you are not alone. Several users across the world are reporting issues connecting to WhatsApp on New Year’s Eve, and the Facebook-owned service has acknowledged the issue. Its New Year’s Eve ! And with over 900 Million users exchanging trillions of messages on New Year, WhatsApp’s servers have probably gone crashing. For me personally, messages have stopped sending or receiving. And while the former part did resume for a while, it eventually went down completely. And yes, since you can’t access it on phone, WhatsApp Web is of no use. So don’t worry, there is simply no issue with your WiFi or even data packs — its WhatsApp. 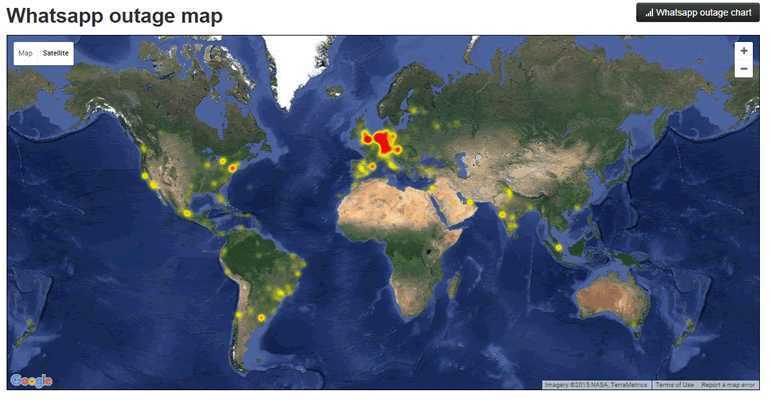 Users globally, have been complaining for a while now, according to searches on Facebook and Twitter. Down Detector confirms the problem, while others aren’t registering anything, as again, not all users are affected. The problem has definitely affected India — but has most severely plagued Europe. US seems to be working pretty normal. New Year’s Eve is perhaps the worst time to go down, and that too for a service like WhatsApp. Telegram guys, your users might just shoot up once again ! On a more serious note though, considering that WhatsApp is now run by Facebook, such issues should have simply not arrived. UPDATE ► 02:00 A.M. IST: WhatsApp is still down at some regions of India and US. Have you been impacted by the WhatsApp outage? Leave a comments with your location.